Whenever I go away, the first thing I do is check out the local supermarkets and deli's. I love the smells, colourful arrangements and trying to find things you can't buy at home. Food, followed by kitchen accessories are way ahead of clothes, jewelery and odd nick-knacks, and I bet many food bloggers are right with me on this. Of course I fit in sightseeing and other holiday 'must-do's' - we all have to compromise sometime! 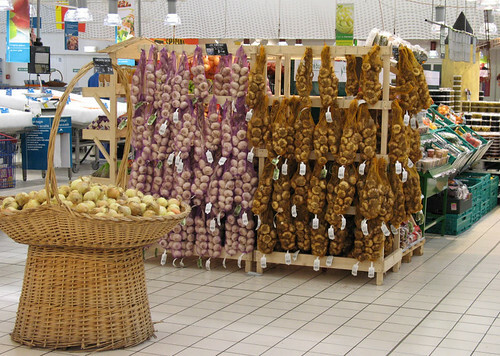 It takes us less than an hour to get to the Channel Tunnel, and as long as there are no hold-ups, you can be cruising round the aisles of the French supermarkets in no time. What's more, it's so civilized going over via the tunnel - it takes half the time of the ferry and there are no worries about the weather, no fight to go up the cold, wet stairs and trudge around looking for a clean seat. No mixing with drunken stag parties at 10.30 in the morning! The only thing that can put a damper on things is a strike by the French side - which can happen all too often! For those that haven't had the 'tunnel experience' I would highly recommend it. Once you have driven onto the train, you just sit in your car and let the train take the strain for 40 minutes. You don't even know you are moving, it's an odd feeling! This smoked garlic is one of the things I brought back from a day trip to France recently. It smells really strong and was banished to the utility room because everyone was complaining. Once it's been cooked in a recipe, you can't really detect a 'smoked' flavour there. One simple way to try and preserve the smokiness is to roast the garlic. Just wrap it in some foil with a little olive oil and some herbs and roast in a medium oven for about 40 minutes - the time it takes to get to France on the train! 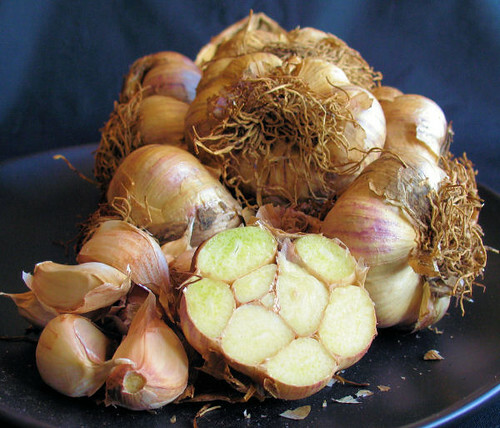 It is wonderful spread onto toasted bread and tomatoes, or added to butter to make smokey garlic butter. I loved the supermarket shot! Unfortunately I am too far a way from the Chunnel! (Is that a word or did I just make it up?) I am very jealous, sounds like a great trip! oh the garlic shot has got all the vampires running away and has got me wanting some now !!! 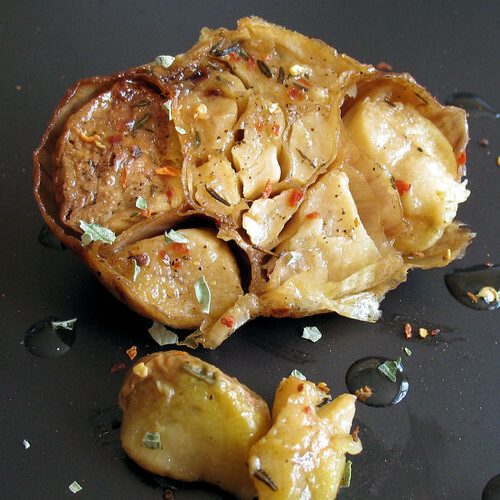 i love roasted garlic , but somehow have not had any for a while now. I guess i'll have to make some now. tried this with 'regular' UK garlic recently. WOuld love to taste the smoky flavour one of these days. Looks delicious. I got a new toy this week! My own portable photo studio with halogen lamps! Marie, the next time we go over for a day trip, we will stop and pick you up ok??? That's what we call it too Holler! Shame you are so far away. Kate - thanks for visiting! Roasted garlic is great isn't it? M&Ms - the smoky flavour really isn't that strong. It is a little disappointing. Marie - how super that you got a portable studio - lucky you! I'll be expecting great things! Tulip - I did go away but this garlic was from a late summer day trip. I would love to be able to try that smokey garlic, I bet it is wonderful. I am really far away from France I am afraid. So no train experience for me this time around. I fully agree about forgetting the clothes and nic nacs when travelling. What did I bring back from Greece??? ?....candied olives, caper leaves, feta, honey, and pasteli. Reminds me I will have to try and make my own pasteli. Sounds fab - and I love the pic of the train interior. I've been on the Eurostar loads as a foot passenger but never on the car train. And I agree with you 100% that grocery shopping in a foreign country is as fascinating to me as a museum visit, and as culturally enlightening :) Fab pic of the garlic! Mmmm that looks excellent. And thanks for the photo! 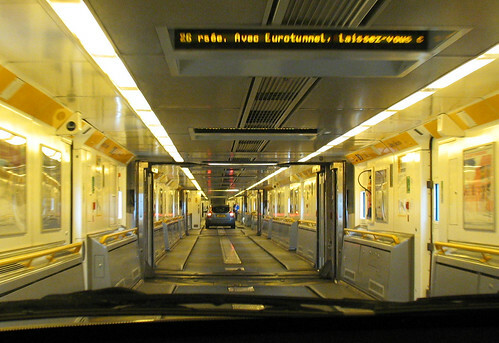 I had no idea that there was a car train on the Eurostar... 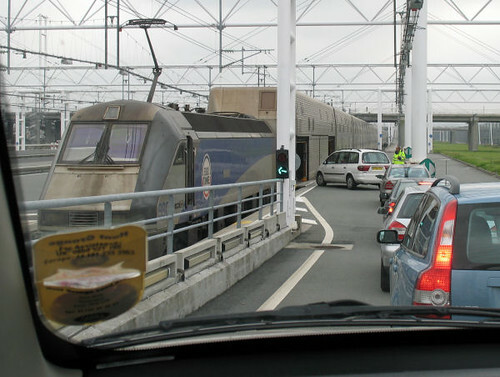 I thought you could just drive through the Chunnel like a normal highway. I do the same when I travel! I always go to some supermarket :) and buy stuff which I'd never find in Spain! Julie - it's not bad!! Valli - oh those goodies from Greece are wonderful, candied olives? Wow! Jeanne - I do like the museums but supermarkets do it for me everytime! Judith - the Eurostar is a passenger train and the other train which uses a different terminal is just for cars/lorries/coaches etc. Manzana - Spanish ones are great too! Dear Nicisme I like so much the smoked garlic, and de recipe is simple and delicious. I love the smells the smoked garlic. La fotografia es super buena, te felicito. Thank you Soraya, and for visiting my blog. The garlic does smell wonderful!